NET Power is a true “no regrets” technology that allows the world to meet all climate targets without having to pay more for electricity. In a world evolving towards cleaner energy, NET Power is more relevant and necessary than ever before. Using the most up-to-date IEA projections, a total addressable market of 1500 GW exists through 2040. The IPCC has made clear that carbon capture and storage (CCS) is essential in getting us to our climate targets. In partnership with renewables, NET Power allows the planet to keep power prices low, maintain grid stability/flexibility, support a growing industrial load AND meet proposed climate targets. 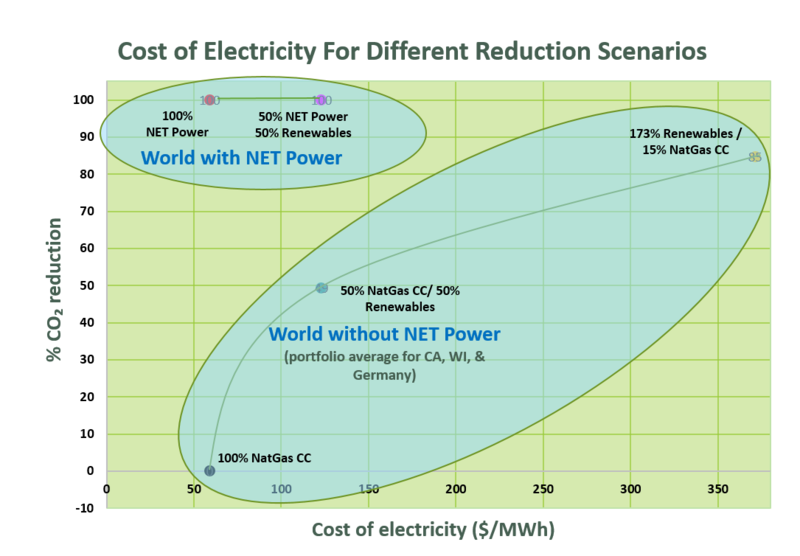 Unlike any other technology, NET Power is economically competitive without the need for CO2 revenues. When combined with CO2 sales, NET Power is less expensive (and cleaner) than any other fossil fuel alternative. NET Power is a true “no regrets” option. In 2008, Miles Palmer and I created 8 Rivers Capital, a technology development firm devoted to addressing large problems in sustainable ways. Shortly after the company was formed, Rodney Allam and Jeremy Fetvedt joined to develop the technology at the core of NET Power (the Allam Cycle). In 2011, NET Power attracted the attention of Toshiba Power Systems Co., one of the world’s most experienced manufacturers of ultra-supercritical steam turbines. Soon thereafter, Chicago Bridge & Iron and Exelon joined to help design, build and operate the finished product. 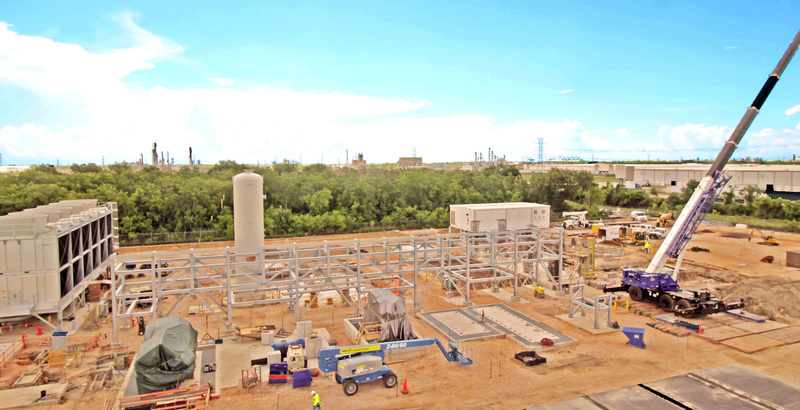 In March, 2016, ground was broken on NET Power’s demonstration plant, located 30 minutes south-east of Houston in La Porte, TX. Commissioning is planned to begin early 2017. NET Power has received significant levels of industry interest from the largest utilities in North America. Moreover, oil and gas companies see NET Power as a synergistic way to achieve low carbon fuel standards. Numerous environmental and climate change organizations are embracing NET Power as one of the best options in an “all-of-the-above” approach to energy production. The first NET Power 295MWe plant build is planned for mid-2020. Most combustion, such as in airplane engines and automobiles, uses the oxygen in air as an oxidant. Air is 78% nitrogen and 21% oxygen, plus other trace elements. Since air is mostly nitrogen, culprit greenhouse gases produced in combustion – such as CO2 – must be separated from the nitrogen in order to store or reuse. This process is incredibly costly and energy intensive. One ingenious solution to avoid separating greenhouse gases from nitrogen is to burn a fuel in pure oxygen in a process known as oxy-combustion. Oxy-combustion has been known for over a hundred years, but has remained elusive due to the high cost of seperating oxygen from air. However, as a means of capturing CO2, it is alluringly simple: when methane fuel is burned in pure oxygen the resulting by-products are easily separated—largely, carbon dioxide as a gas, and water as a liquid. Oxy-combustion had one big problem: oxygen was expensive to produce. The Allam Cycle solves this problem by eliminating the use of an comparatively inefficient steam cycle that dumps massive amounts of heat in the form of water phase change. Instead, the Allam cycle retains that heat within the system and uses the energy to aid air seperation and heating after recompression. Thus, 94% of the mass coming into the front of the turbine is hot (720° C, or 1330° F), maintained by massive heat recuperation. 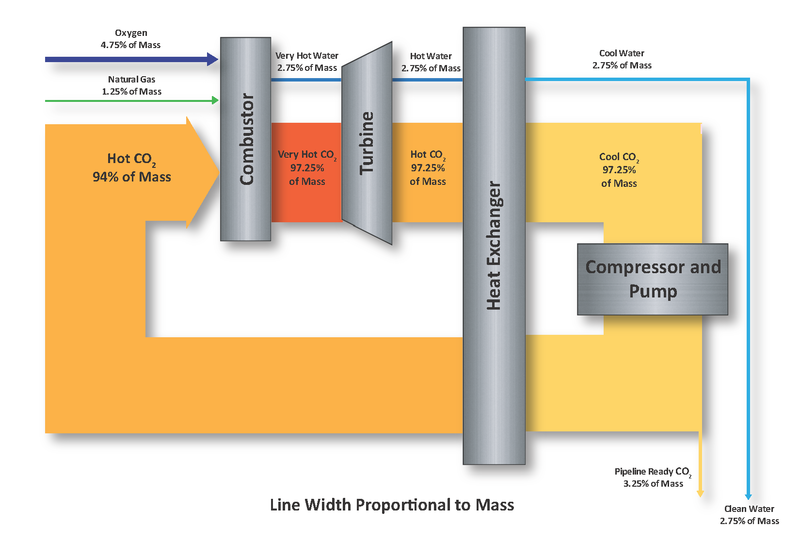 This means that the remaining 6% of combustible mass (fuel and O2) only has to supply a little more excess energy to raise the temperature of the flow to the required turbine inlet temperature (1150° C, or 2070° F). By focusing on a single recuperated system, Allam Cycle plants avoid the complexity of “combined cycle” plants. Furthermore, every single component is readily available — with the exception of the turbine, which is being designed, engineered and built by Toshiba, the world’s leading manufacturer of advanced ultra-supercritical turbines. The World Economic Forum established the “Future of Electricity” platform to help advise stakeholders around the world on sustainable ways by which electricity needs can be met. Many technologies hold promise. All come with trade-offs, and not all trade-offs have the same perceived value propositions. While renewables are key to our future, they cannot do all of the lifting. Heavy reliance on renewables results in diminishing returns, with costs that might impede their acceptance. Even in high renewable penetration scenarios, gas build-out remains largely unchanged due to renewables’ baseload support requirements. Estimates show that a buildout of 50% renewables with 50% Natural Gas Combined Cycle baseload support (NGCC) doubles the cost of power. A 173% renewables and 15% NGCC buildout (renewables with associated storage for intermittency) results in a cost of power nearly 6x of today’s levels. The cost of power has been linked previously to trends of economic growth and unemployment, with high power costs having dramatic impacts on both. As a result, low carbon fossil fuel emissions have been seen as a key to mitigating climate change. Switching from coal to natural gas helped slow the growth of CO2 emissions, but Carbon Capture and Sequestration (CCS), or the process of capturing and storing or reusing carbon dioxide emissions, is needed to make important headway. The IPCC Fifth Assessment models demonstrate that CCS is the single most critical tool to achieving climate targets. Scenarios without CCS result in the greatest number of failures to meet climate goals, and projected costs for electricity soar. Over the last decade, CCS systems had proved to be uneconomic in the absence of a governmentally induced price on carbon or a high commercial price for CO2. While government intervention failed to create the right circumstances, CO2 could be sold in the commercial markets to oil companies for use in enhanced oil recovery (EOR). Because of the expense of operating CCS systems, oil needed to be above $75 per barrel to support the right CO2 price. As the price of oil fell, some felt that the push for CCS should be relaxed and that renewables and nuclear should pick up the missing capacity. Those who do not believe in the progress of technology are often surprised – much like McKinsey – when, in the 1980s, it projected that the total market for cellphones in 2000 would be 900,000 (by 2000, 900,000 new cell services were being sold every 3 days). We make a mistake unless we recognize that current carbon capture technologies are analogous to the “brick phone”: they are valuable leaders, bringing in developers of the next generation of technology. We saw a similar phenomenon happen in solar. By standing on the shoulders of those before, the developers of the Allam Cycle have devised how to make CCS affordable. NET Power generates electricity at the same price as existing combined cycle gas turbines, and at no extra cost it captures all of the CO2. This redefines the game of carbon capture. The IEA projects 705 GW of gas capacity additions from 2015 to 2025, and an additional 748 GW from 2026 to 2040. Were all this capacity to be supplied via NET Power it would equate to deployment of nearly 5000 NET Power turbines—providing for the capture of 3,900 million tons of CO2 every year. If planned coal buildout were averted (or coupled with CCS), an additional 12,300 million tons of CO2 would be diverted from the atmosphere every year. NET Power is the most synergistic fossil fuel fired baseload support to pair with renewables, creating a truly resilient, cost-effective, carbon-free electrical grid. Continued buildout of renewables requires ongoing baseload support by NGCC, resulting in escalating costs of power. At the highest ends of renewable penetration, in order “to achieve CO2 reductions on par with balanced portfolios, intermittent renewable systems must be built much larger, to between 154 and 195% capacity levels.” The 173% point refers to this scenario. NET Power represents a completely new frontier for power production. Data obtained from: Brick, S., and Thernstrom, S., Renewables and decarbonization: Studies of California, Wisconsin, and Germany, The Electricity Journal, 2016, 29, 6-12.